Prior to 1920 there was no Catholic Church in Potters Bar. In that year, when Mr. Beckett came to live in Wyllyotts Manor, he placed a room at the disposal of the few local Catholics, where his son, Fr Maurice Beckett from Westminster Cathedral, celebrated Mass at weekends. In the same year, two Priests and one Brother from the Spanish House of the Vincentians (Congregation of the Missions (CM)) arrived in Potters Bar to establish a House of Studies for their young priests to learn English before embarking on missionary work around the world. They took up residence at Hillside House, for which the main entrance was from Barnet Road. At about the same time, Irish Dominican Sisters purchased a large house in Church Road and established the Rosary Convent, whose chapel local Catholics could attend. The Convent was closed in 1937 and demolished in 1956 to make way for a road named Rosary Court where some maisonettes were built. 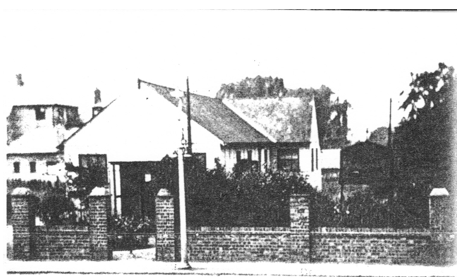 1925 A temporary Church, dedicated to St Francis Xavier and seating about 40, was built alongside the Southgate Road boundary of Hillside House. Many furnishing were transferred to the Church from Boundary House. It served as the Parish Church and one of the resident priests acted as Parish Priest. 1931 Fr. Gumersindo Grande arrived in Potters Bar and was with us until 1992, some 61 years, and was Parish Priest for much of that time. 1945 Saturday 20 January. A German V2 Rocket fell in Southgate Road demolishing the Church of St Francis Xavier and a number of adjacent houses. Twenty-one local residents were killed and there were many casualties. The only item that survived the destruction of the Church was a wooden statue of Our Lady, which was later placed in the new Church of St Vincent and St Louise when it was opened. This statue now stands in the new Church of Our Lady and St Vincent. 1957 Fr. Evelio Ortiz, who had been the Assistant Priest at St Francis Xavier between 1940 and 1945, returned from Dunstable to take charge of the building of a new Church. 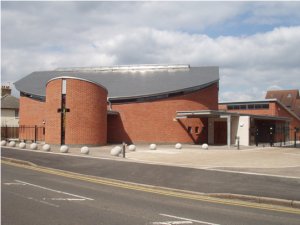 1962 The Vincentians opened their new Church, built on the site of St Francis Xavier in Southgate Road. The Church was designed by Felix Velerde and a Spanish artist, Joachim Camin, carved the black marble altar and painted the mural on the wall behind the altar, measuring 30 feet by 16 feet. The seating capacity was over 200 and many of the original parishioners of St Francis Xavier returned to the new Church. 1967 St Vincent’s was designated the Parish of Potters Bar East and Fr Ortiz became the Parish Priest. 1992 Due to the reduction in the number of Vincentians in residence, it was decided that they would sell the property and return to Spain. From 1922 to 1992, some 55 Priests and Brothers served or studied in Potters Bar. Following the departure of the Vincentians, a Diocesan Priest, Fr. Michael Donaghy was appointed Parish Priest. 1995 St Vincent’s was acquired by Westminster Diocese. 1996 The Hospitaller Order of St John of God, who had been in the area since well before the second world war, moved into St Vincent’s, with the intention of developing it for their work of care. Fr. Michael Francis was appointed Parish Priest. In view of this possibility, the question of amalgamating the two parishes was put on hold. Unfortunately negotiations were not concluded satisfactorily and having found another suitable site, the Brothers departed in 1998. 1998 Fr. Peter Lyness was appointed Parish Priest. 2001 December Following a provisional decision by Cardinal Cormac Murphy O’Connor that the two parishes should merge, a Steering Committee under the Chairmanship of Bishop James O’Brien VG was formed, which included both Parish Priests and three members from each parish. 2002 August 31 Fr. 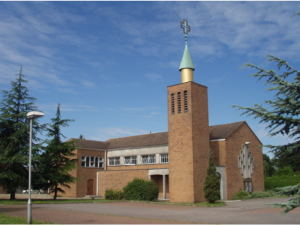 Peter Lyness left to become Parish Priest at St Teresa of the Child Jesus, Borehamwood, Hertfordshire. 1950 August 15 The Church dedicated to Our Lady of the Assumption, and originally proposed as a Parish Hall, opened in Mutton Lane, Potters Bar. Fr Joseph Davey was appointed as the first Parish Priest of the new parish of that name. Fr Davey took up residence in the sacristy area of the Church. 1958 Fr. Richard Berry succeeded Fr Davey. The house at no. 243 Mutton Lane was acquired as the Presbytery. 1963 Fr. (now Canon) Peter Gilburt was appointed curate. 1967 Pope Paul RC Junior Mixed and Infants School opened. 1968 July Fr. Gilburt left. 1986 Fr. John Miller succeeded Fr Moriarty as Parish Priest. 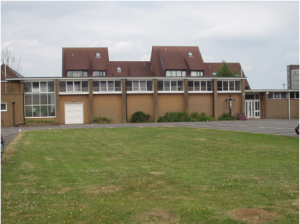 1995 A Steering Group, chaired by Mgr Ralph Brown VG, comprising the Parish Priests and members of both parishes was appointed to consider the future of both Potters Bar parishes and to report to His Eminence Cardinal Basil Hume OSB with recommendations. 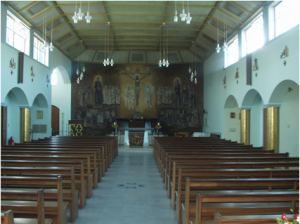 1997 Plans to increase the seating capacity of Our Lady’s and provide meeting rooms and improved community facilities were approved by the Parish in Council but subsequently deferred to allow plans for development of St Vincent’s site by the Hospitaller Order of St John of God to be explored. 1999 Fr. William Wilby succeeded Fr Miller as Parish Priest. The Presbytery was refurbished. 2002 May 10 The Potters Bar rail tragedy. Seven people died including Mrs. Agnes Quinlivan, a Eucharistic Minister. 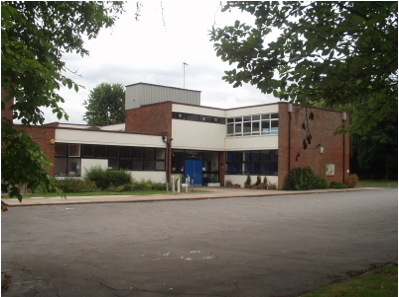 Parishioners manned the Parish Centre round the clock for 5 days as a rest and refreshment centre for members of the Emergency Services. 2002 August 31 Fr. Wilby left to become Chaplain to St Wilfred’s Convent, Chelsea, London. 2002 Fr. Timothy O’Connor was appointed parish priest. ‘An Antiphonal design is being considered’. This phrase was mentioned almost as an afterthought in instructing the architects, Francis Weal and Partners with regards to our requirements in our new Church building. We wanted something to reflect our understanding of Church in the twenty-first century while at the same time being faithful to our tradition. We were thinking of the Church as the Domus Dei and Domus Ecclesiae – the House of God and the House of the Church as the people of God. The antiphonal design has its roots in the monastic setting where the monks gathered in prayer sitting facing one another. Today more than ever we recognise the Church as the People of God that finds it fullest expression as the Body of Christ when it meets to celebrate the Eucharist. The new Church is in keeping with the liturgical norms of the Roman Catholic Church. There is social as well as sacred space linked by a spacious welcoming narthex. The Baptismal Font and Pool are situated at the entrance to the sacred space. The Holy Oils of Chrism and of the Sick are kept in the Ambry close to the place of Baptism. Seating is provided for four hundred people and is arranged in such a way that nobody is more than six rows from the spinal sanctuary. The Presidential Chair, the Lectern and the Altar are of the same material emphasising the unity of our Eucharistic celebration. A generous space is provided for an organ and a variety of musical instruments. The Blessed Sacrament Chapel gives honour and reverence to the Blessed Sacrament as well as providing an area for private adoration and prayer of the faithful. We enlisted the skills of Stephen Foster to create the magnificent ornate doors connecting it to the Church. Directly opposite the Blessed Sacrament Chapel is the Catechumenon Room which incorporates the Confessional and includes a facility for anonymous or open Confession. Stained Glass has long been part of the ethos of our Church buildings. We are fortunate to have discovered Alex Le Rossignol bringing a valuable ecumenical dimension to our endeavour. Her designs for the oval windows in the Church, the Resurrection and the Annunciation, portray the central message of Christ as the Alpha and Omega and our dedication to Our Lady. The triplet windows depict something of St Vincent de Paul, St Louise de Marillac and St Francis Xavier, patrons of our two former Churches at Southgate Road, the first of which was destroyed by a bomb just at the end of the Second World War. Six children from the parish had direct input for these windows. In the Blessed Sacrament Chapel, the Cross window reminds us vividly of the cost of Christ’s sacrifice. 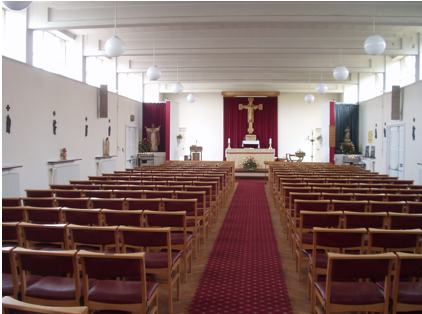 The Parish Centre comprises social space for small and large gatherings of parishioners and local needs. This new Church has been made possible by the vision, dedication and unstinting hard work firstly of the original Steering Committee of the former Parishes of Our Lady of the Assumption and St Vincent de Paul and St Louise de Marillac, in consultation with our Diocesan Authorities who had the bigger picture always in mind. Secondly when the two parishes were amalgamated in 2002, the New Church Committee appointed the Architect and through Satellite Committees brought this work to completion. 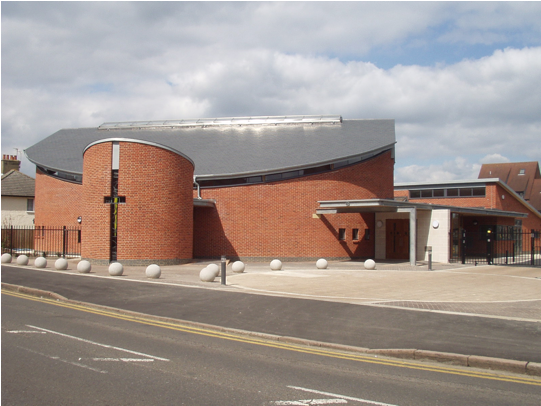 Built on the site of the former Church of Our Lady of the Assumption (1950 – 2004) and embellished with numerous artefacts from the Church of Saints Vincent de Paul and Louise de Marillac including the Stations of the Cross and Tabernacle, the new Church stands as a symbol of a unified Catholic Community in Potters Bar. The following pages trace the development of this community in modern times. Our heartfelt prayers and gratitude go to all members of the community, past and present and to our benefactors living and dead. May 2006 Fr Tim O’Connor, Parish Priest. 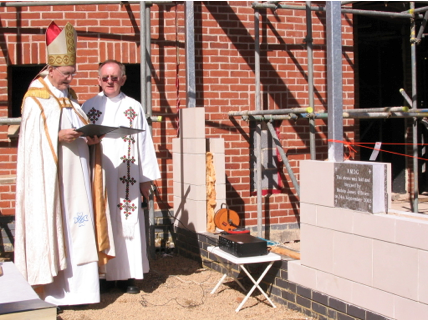 2005 September 24 The Foundation Stone was laid by Bishop James O’Brien. 2005 December 27 The Church of St Vincent de Paul and St Louise de Marillac was closed. Thereafter all Sunday Masses were held at Pope Paul School. 2006 April Holy Week celebrations took place in the new Church of Our Lady and Saint Vincent. 2006 May 19 Dedication of the new Church with Mass concelebrated by Cardinal Cormac Murphy O’Connor, Bishop James O’Brien, Fr Tim O’Connor, former parish priests and other clergy.